Extended over and over again as Jesus makes His way into our lives, moving into our world right where we are in our fallenness and humanness. I’m banking on that daily this year as I move forward….for that is the only direction we can go—falling forward, even though (true confession) one might feel like a fraud. Perhaps I’m being too harsh, but here are my thoughts: I’ve written in this space many, many times about the importance of stillness, listening and Sabbath-ing. Not in a stop-what-you’re-doing-and-rest-for-an-entire-day-kind of Sabbath—because that’s not doable in my world. No, I mean Sabbathing on the Page—taking an hour a day or an hour a week to steal away and listen to the Holy Spirit speak and write down what you hear. The importance of listening and stillness came home to me three Januaries ago when I read this book by LL Barkat (who coined the idea of ‘Sabbath on the Page’). I am passionate about the practice, primarily because of personal revelations that came to me and my confidence God wants to lead others in hearing from Him this way. I’ve shared about it at a Retreat, blogged about it, and consider it in thought and practice the foundation of my small space here on the internet. But the reality? Stealing away to listen and write, be still and hear God’s voice hasn’t happened much this past year. Hence the fraud feeling. There have been very, very few hours I could call my own. At the end of a long day of work, running errands and involvement at church and Life in General, there’s just no time. The longing to get away is what I miss, the excitement of hearing from God, the confidence He will speak, the intimacy afforded me with my Jesus while I just sit. What’s changed in the last two years? Well, my husband retired; he’s home all the time. I suppose that’s a practical answer, but maybe it’s just an excuse. If I really thought an hour alone outside every day was important, I’d make a way. So I’m penciling in writing time this year and quiet-out-on-the-deck listening time, even if it’s only once a week. 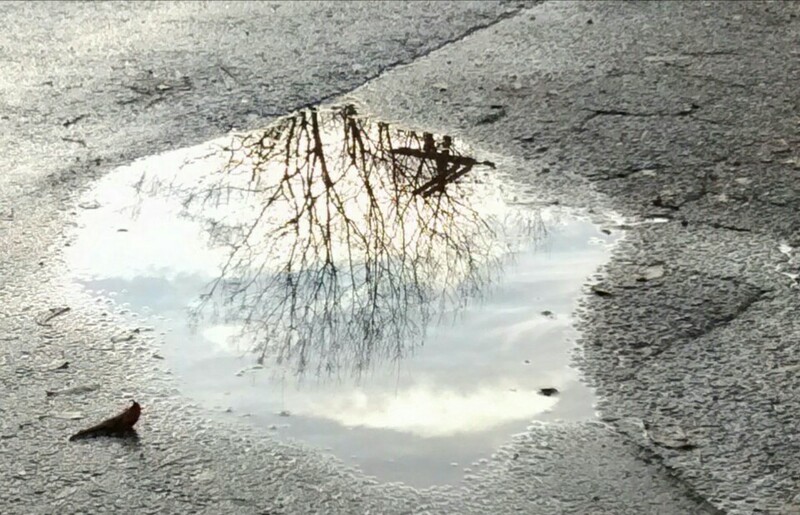 So I will begin, standing at the the edge of the puddle that is my life…. Amorpohous right now, changing and moving, blown about by the wind. But as I step towards the quiet, still center, there I’ll see my reflection—find who I am, who God is, as I lean in and find the beauty mirroring back to me in the skies…. And I appreciate you, friend! Important, imperative and by God's grace doable. One day a week…it's a start, eh? Amen, Jody! Juggling my calendar and the kids, trying to find the space and time and quiet to listen and write. Hard…but so important. No. Imperative. So glad you're taking Wednesday afternoons…. I'm so glad you're working on another Retreat, Kelly. God in the Yard is an easy read….There are only 12 chapters (supposedly 12 weeks) but it took me 7 months to complete…. 'cause you know, time. But it was so worth it. Oh, and I'm so glad as well that God sees our hearts. Thanks for linking, Jody 🙂 I believe I REALLY need to read that book, especially as I'm working on a Writing related retreat. And, we all feel like frauds now and again. I'm thankful God sees the desire of our hearts, not just the times we get it right! Nancy, you are so sweet…. That thought occurred to me the other day after I wrote this–trying to balance the desire and longing of my heart with the realities of life. It's just a new normal for me–and I think the fact that I WANT to pleases the Father. When I show up, He'll speak. But it's not like He's mad at me in the meantime…. It's like the story of the Prodigal Son–the Father didn't belittle him when he came home, he threw him a party. So–just come when we can, right? (and kick that devil liar to the curb when he shows up). Well, that's definitely some food for thought, Lisa. Thanks for your encouragement and reading along. God bless you! Oh, I'm glad you are going to venture out into this. It reminds me of something I heard Deepak Chopra say about meditation, “If you don't have time to meditate once a day, you need to do it twice a day.” 🙂 It made me sit down today and make time to meditate. Blessings to you, Jody! I know God will use that time with him in precious ways. Mari-Anna, how nice to read your words of encouragement. Thank you and God's blessings to you! I hear you. Being still in God's presence and listening…that's what I love most…yet it is challenging to find that time within family chaos. But so worth to make the effort. So I keep trying to do so preferably every day but as often as possible. Thank you for this post, Jody. God's richest blessings! Isn't Fernando Ortega's music a balm to the soul? You can read “God in the Yard” (the book I mentioned) any time….yes, there are a lot of good books. Thanks for reading, friend. I love that song, too, and was just listening to it yesterday. I think I need to read this book about sabbath on the page. My “to read” stack of books is getting overwhelming, however.